It’s undeniable; for girls, that dream wedding dress is always on the back of our minds (and Pinterest boards). But there’s a dream, and then there’s the downright unimaginable. We’ve collected a list of the top 10 most expensive celebrity wedding dresses to date (listed in order from least to most expensive), and prepare to be stunned. The national average cost of a wedding dress in the United States is $1,211, and some of these gowns go up to half a million dollars. While we may never get close to touching dresses like these, they are great sources of inspiration for your own big day. And hey, the most important part is that you feel like a million bucks – instead of actually spending it! Jennifer Aniston – $50,000 First up, we have Jennifer Aniston with a glass-beaded, low-backed Lawrence Steele gown worth an estimated $50,000. True to her style, it was a classic and elegant look. 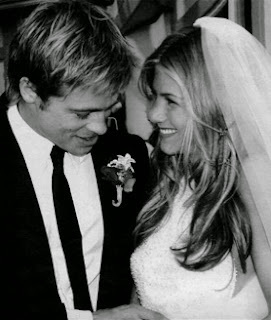 She wore this gown when marrying Brad Pitt back in July of 2000. Unfortunately, the couple is no longer together, but at least the dress will always be remembered! Tori Spelling – $50,000 Back in 2004, the Beverly Hills, 90210 star had a custom crystal-beaded, Badgley Mischka gown made for her for about $50,000. The dress was sweet and simple, but the peek-a-boo lace details really saved the gown from being a bit on the humdrum side. 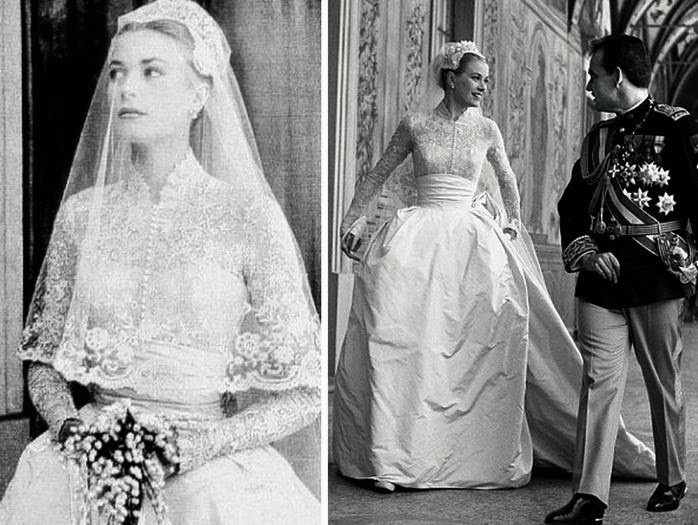 Grace Kelly – $68,000 If you’re marrying a prince, you’re living the fantasy. What’s a $68,000 wedding dress to a royal family anyway? 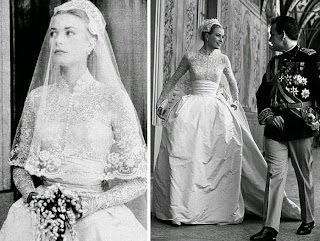 Actress and socialite Grace Kelly married Prince Rainier of Monaco in 1955 in a dress designed by MGM seamstress, Helen Rose. The dress was made of silk taffeta, silk net, lace and seed pearls and cost $8,000 back then but would cost about $68,000 today. Madonna – $80,000 The queen of entertainment met and exceeded expectations with her wedding dress in 2000. She married Guy Ritchie in a fitted, strapless Stella McCartney (who was the maid of honor as well) gown with a long train, worth $80,000 and a 19th-century lace veil. In true Madonna fashion, she really put on a great show. Victoria Beckham – $100,000 In a strapless, ball-gown style Vera Wang wedding dress, Posh Spice said her “I do’s” to David Beckham in a dress worth about $100,000. The fitted bodice and flared skirt perfectly accentuated the petite figure of the British pop star. Princess Diana – $115,000-150,000 When you imagine a classic, princess-style dress, you’re probably envisioning a billowy silk gown, wide puffy sleeves and long silk trains and veils. 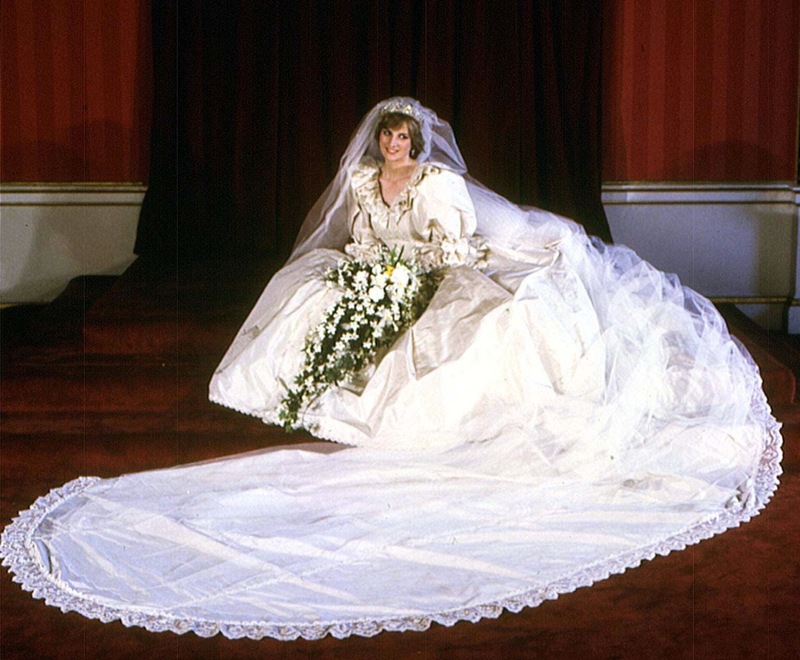 Enter Princess Di and her iconic David Emanuel princess gown with 250 yards of tulle, lace and taffeta; 10,000 pearls and sequins; and a train that was over 25 ft. long. Nothing has yet to compare! Melania Knauss – $125,000 For the bride of a billionaire, $125,000 for a wedding dress must feel like pocket change. That’s about how much Melania Knauss’s wedding dress cost when tying the knot with entrepreneur Donald Trump. Her dress was said to have been so large that she was told to eat well before the wedding, so she could have the energy to hold up her dress – and we don’t doubt it! Her dress was made with 300 ft. of tulle and embroidered all around with rhinestones and pearls. Catherine Zeta-Jones – $140,000 On the day of her wedding with Michael Douglas, Catherine Zeta-Jones wore a long, custom-made and hand-beaded Christian Lacrois wedding gown that cost about $140,000. With a deep v-neck, straps and a long veil and train, it suited her classic beauty well. 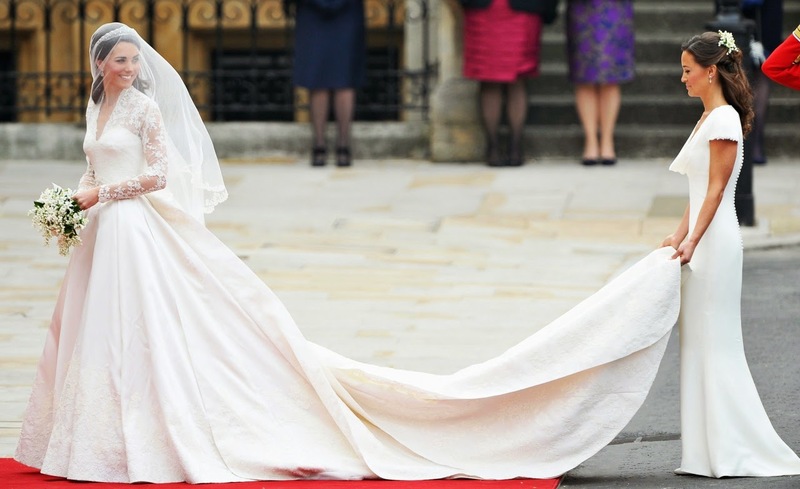 Kate Middleton – $400,000 Appropriately, the last princess on our list had the most expensive wedding dress of them all. Who needs Disney when we have this real life prince and princess on our daily newsfeed! Kate Middleton’s wedding ceremony was watched all over the world, and her couture Alexander McQueen gown didn’t disappoint. With an estimated cost of $400,000, this lace and silk gown was completely handstitched down to every last detail. 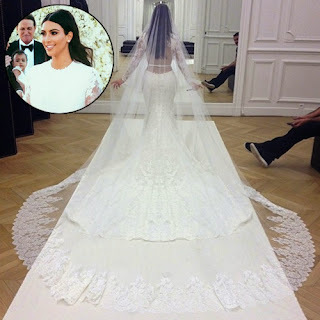 Kim Kardashian – $500,000 And the most recent celebrity wedding dress on this list takes the cake! Reality star, Kim Kardashian, got hitched with mega hip-hop star, Kanye West, in a Givenchy Haute Couture gown that cost up to half a million dollars. With lace appliques, a lace mermaid veil and an open back, Kim proved herself as a top fashion icon. Which dress do you like the best, and which one do you think was actually worth the hefty price tag? Let us know in the comments below! My friend Wedding reception is held in the main hall. The place was gorgeous and perfect for a wedding. I have been to several weddings here but it hasn't gotten old. The wedding venues Los Angeles are absolutely beautiful and the views are breathtaking.